Martin was missing so a lot of idle (i.e. more idle than normal) Battletech players hanging around. So the old favourite Formula D(e) got rolled out. 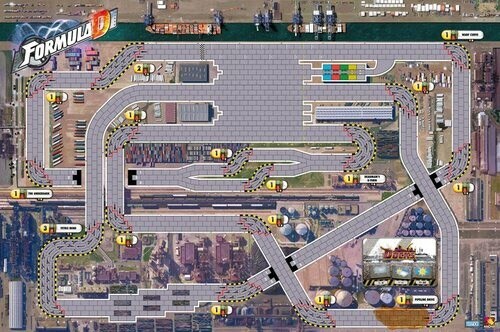 A new map set bought on the cheap by Craig, Singapore GP circuit and a Docks street race circuit. The randomly allocated car\driver I received can only be described as a bit strange, a manga style oriental female, with furry animal ears, and a special ability to distract overtaking drivers! On the docks map I couldn't really see the point of the Container sections as it does little to affect the paths, the oil section also seemed a bit weak, with only a slight chance of damage from it, and no chance of slides like you might expect. 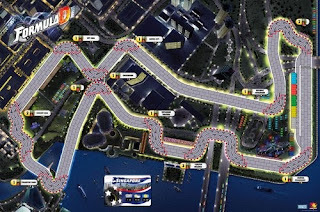 Also the entire circuit, except for a short dual carriageway section, never gets below three car widths so there very few bottleneck opportunities. An element of confusion as to which was the proper order of the three circuits so the decision was that after the first lap, the other two could be taken in either order, this caused the field to split in two, which made the track uncongested so few collision and blocking opportunities, it was a straight speed race. Messed up getting first by mis-positioning myself on the penultimate corner forcing a gear drop that cost me on the home straight as Craig, coming off the fast middle circuit at high gear flew past to take the flag. Raced the more conventional Singapore circuit with the same street cars. This ended up a two lap race due to time constraints. Starting from third I stalled on the line and a string of minimum dice rolls saw me trailing behind everyone. Managed to start reeling them in, and ended up doing a demo derby job on an opponent, who due to bad luck lost all his bodywork less than halfway round the first lap. This sped up the game quite a bit! Craig ended up just missing the last corner, leaving me clear in a higher gear, so I finally managed to win one. Colin limped into third place in first gear, after wearing all his tyres and brakes out.